When DC Comics saluted its amazing history pre-DC52 by returning icon creatives to icon characters, one artist more than any other showed they still had what it took to foot it with today's best; Mike Grell. Teaming with writer Denny O'Neil, DC Retroactive Green Lantern had just one fault - it wasn't an ongoing. 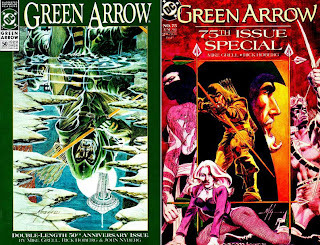 The writer / artist has worked on both Tarzan and James Bond, his Green Arrow: The Longbow Hunters redefined both its title star and Black Canary, and his creator-owned Jon Sable comic helped turn comics towards both creator-owned comics, as well as the grim n' gritty style of the late 80's. Not bad for a man who originally wanted to be a lumberjack, like his Dad. Mike Grell (MG): I’m feeling much better, thanks. A bit surprised at how quickly I got out of shape and how slow it is to get back into fighting form. Apparently that’s what happens when your odometer clicks over into the AARP range. IADW) Despite being influenced by Neal Adams, you revamped his Green Arrow. Trick arrows and Erril Flynn costume - both gone. You humanised the character even more than Denny O'Neil did - the best writer in comics! Now the Arrow TV series is trekking a similar path, taking hits from your work such as it's darker 'Emerald Archer', right down to not calling the character 'Green Arrow' which was a staple of your run. As you've supplied 'police sketches' for use in the show, how does it feel to have a character you are so closely associated with, and in your way, now made a global household name? M.G.) It’s a kick in the pants. It’s rewarding to know all the effort that went into re-creating the character wasn't wasted and gratifying to know that my work has had a lasting impact. When they used the name “Judge Grell” in the series as a minor tribute, suddenly, after 40 years, my family now think I'm famous. IADW) You are one of a handful of creators who can say they worked on Superboy and The Legion of Super-Heroes when it was the top dog in sales at the DC Comics. As a hardened fan eternally waiting for audiences to (re)discover what a thoroughbred concept the Legion is, I have to ask what is it you feel are key traits of a successful and accessible Legion? Does the Legion have to look like a legion on the page? M.G.) 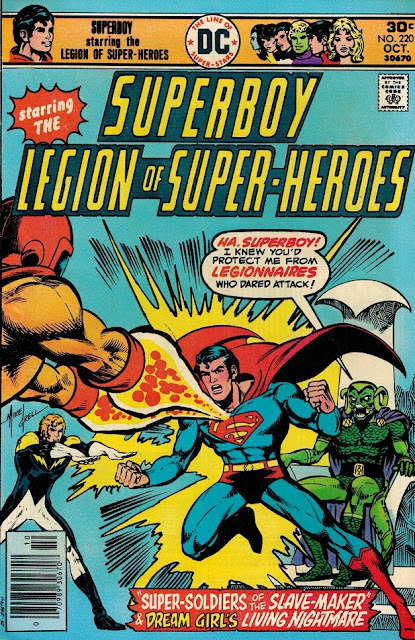 The Legion of Super-Heroes has the most loyal fans in the industry. I still have folks bringing me old books, telling me it’s their favorite or that it was the first comic they ever bought. And that’s the reason for the popularity - it’s a great entry-level book to engage new readers. It appeals to young people because it’s about young people. And, face it, you're always going to have a soft spot in your heart for the first book that caught your eye. “Legion”, by definition, sort of implies a large group, so I think the answer is “yes” - but - it doesn't mean you have to draw every single member in every issue. I think it would be better as a rotating cast, more ensemble, so you can keep it fresh... And maybe kill off a character or two to keep it interesting. (Some folks still haven't forgiven me for Invisible Kid)! IADW) With the likes of Jon Sable, Bar Sinister and Shaman's Tears, you are literally one of the trail-blazers for establishing todays creator-owned comics industry. With Image owning every spot in last year's top selling graphic novels list, the year's top-selling comic, and having just announced even more 'Big Two' creators to join its ranks in 2014, what are your thoughts on how the genre has grown - and will we see more from you in 2014? M.G.) Having taken the gamble that I knew would lead to creator ownership, royalties and more security for comic creators, I'm very proud to have been part of the first wave. We didn’t know if there would be landmines waiting for us, but we were willing to take the chance. You can make that part of my obituary. I have several projects on tap for 2014, including a novel, a screenplay and another graphic novel. Stay tuned. IADW) Speaking of Shaman's Tears, I used to cut every ad of that series out of Advance Comics to use as posters. From that era, do you think the once-planned Shaman's Tears / Turok Dinosaur Hunter crossover will ever see print? M.G.) Not a chance. That deal fell apart on a corporate level. IADW) As the artist whose daily output was once a mammoth 3 - 5 pages, do you have any words of advice for creators of the next generation looking to get into the ring, and is there one particular newbie in comics now who has caught your eye? M.G.) Learn to draw, paint and use Photoshop. Stay on top of new developments and ahead of trends - lead, don't follow. And for God’s sake, learn to tell a story. Pretty pictures aren't enough. Study Will Eisner. I'm still old school enough to admire guys who can really draw - Billy Tucci, Chad Hardin, Steve Scott. Mark Texiera still draws the most gorgeous babes. I have to thank Mike for allowing this interview and being so open in his responses. 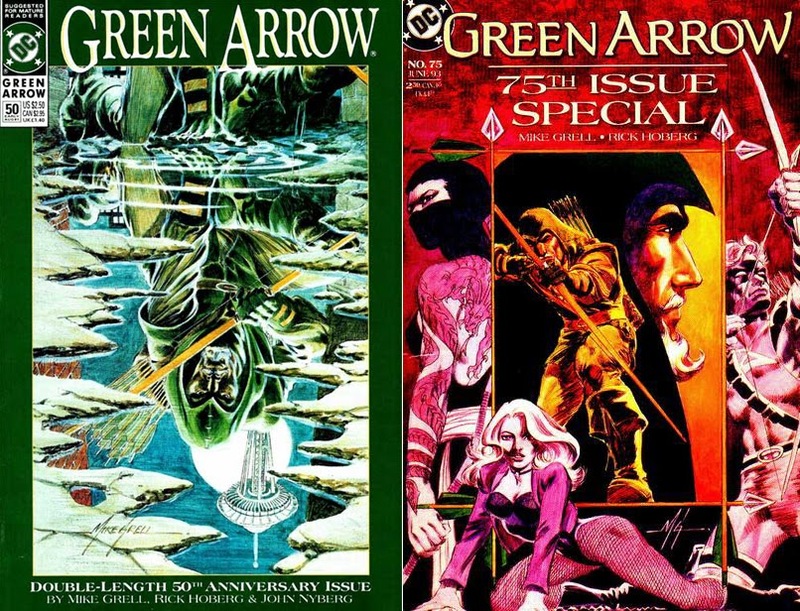 From Warlord to Green Arrow, it must be amazing to be able to say that you trailblazed so many different events and styles in comics, and as a fan and interviewer, I am very lucky Mike chose to reflect on that career with me. I wish him all the best, and look forward to whatever lies ahead from his talented pen. What do you think? Let me know your thoughts below! For all things Mike Grell, be sure to visit mikegrell.com For more On The Five interviews with the likes of Norm Breyfogle, Dan Jurgens and Bob Layton, click here. Mike Grell was truly amazing on the LSH - such dynamic layouts and figure drawing. After the staid figurines of the 60s, his style, so unique, was startling. Some of his LSH outfits were daring - Saturn Girl's pink bikini, Cosmic Boy's er basque[!] and so on, really made such a dramatic change...I collect every LSH Archives once a year [every year during the 90s] and now have twelve volumes [plus the Showcase edtitons and many of the original Superboy and the LSH of course]. The Archives have just come to the end of the Grell era, in fact. In his interview he does state the strip could've used fewer Legionnaires and his stories reflected that - many of them did feature just two or three menbers. His Jon Sable also was a labour of love for Grell, wasn't it. He tried for so long for proper recognition for this character who coulve been his version of the Punisher, maybe. We never ever seem to see Mike Grell anymore, do we, none of his work ever seems to find print and its a shame, unless its in reprints [which is great but we want new stuff!]. The only magazine that features his work in any great depth is Roy Thomas's mag Alter Ego, that prints some superb sketches, esp his X-Men designs like Nightcrawler which legend has it that he originally proposed for the LSH [Id have loved a mash-up between the LSH and the New X-Men of that late 70s era]. I heard he had some health problems and am glad hes over the worst - our comic legends from our childhood are to be treasured and revered. And Grell rarely it seems ever gives interviews so this is a coup of sorts, Dan. Thank you for this interview, and thanks also to Mike Grell for his time. I have a green and White slipcase hardcover edition ive had for over ten years and never read iy past the first story. ..must resolve that sometime and get round to reading it. Hey Karl! Glad you liked the interview as much as I did putting it together! Mike did an all to brief stint on an X-book, and while he had a natural way of drawing Iceman few could beat, sadly it wasn't as long as I would've hoped. I thought Dave Cockrum originally designed Nightcrawler to appear in a team called The Outsiders within the Legion of Superheroes stories? Mike followed Dave on Legion so not seeing his LSH Kurt is something all Legion fans like us truly missed out on! Mike has done some work on the digital only TV tie-in Arrow series, but I think my top pick of his recent work was his variant to Star Trek / Legion of Superheroes which was just awesome on so many levels. As always with just five questions it can be hard to cover a career so expansive, I mean James Bond to Tarzan? Just wow. From Jason Blood to Metamorpho there's not a character in comics that couldn't use Grell's touch. Id heard of this Outsiders team but don't know much about them really. One thing if have waited with the proverbial bated breath to see wouldve been to see some of Grell and Cockrum's X Men in the LSH. Hey Karl, I'll show you that team next week here on IADW so watch out! What happend to the next Jon Sable Miniseries "Rules of the Hunt"? Will it ever come out? Why do we have to wait this long? Glad to read Mike is doing well. I hope to see more Jon Sable comic adventures in 2014. It's been too long in my opinion, with all of the political intrigue going on these days, I think Jon Sable is relevant today. You're not wrong there Stephonie! Sable sure could make a pretty relevant comeback with all that's going down in todays news headlines.